This is a cross-section scanning electron microscopy image after hydrogen silsesquioxane patterning, sequential infiltration synthesis and removal of initiated chemical vapor deposition topcoat and organic components. Image: Hyo Seon Suh/University of Chicago. For the chips in our computers and smartphones to get faster and faster, their components – the circuits and wires through which signals flow – have to get smaller and smaller. The miniaturization of these wires has already taken scientists on a journey almost to the atomic level, but now they have begun to address – and even surmount – certain barriers in physics that have prevented them from making even smaller wires. In a recent study, researchers from the US Department of Energy (DOE)'s Argonne National Laboratory, the University of Chicago and the Massachusetts Institute of Technology (MIT) have developed a new way to create some of the world's thinnest wires. And they have done this with a process that could allow the mass manufacturing of these wires with standard types of equipment. They report their advance in a paper in Nature Nanotechnology. 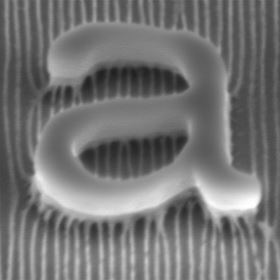 Templated assembly, or directed self-assembly, as it is known, represents an easier and more cost-effective way to make nanowires with widths below 10nm (about 100 atoms thick). In this study, the self-assembling materials are large molecules known as block copolymers, which are the two-headed beasts of the chemical world – one end is water-loving, the other end is water-hating. Upon heating, they spontaneously form highly uniform structures at the molecular scale. On their own, however, the block copolymers used in this study would form a pattern that looks like a fingerprint or a piece of brain coral – useless for the creation of functional nanowires. The key to changing that pattern into something more ordered is the use of chemically-patterned templates. Past approaches to making tiny ordered nanostructures used expensive specialized optics to direct extreme wavelengths of light or electron beams to etch patterns line-by-line. This new approach involves creating a chemical pattern as a template using these same tools at relatively low resolutions, and then filling in the template to fabricate high-resolution patterns using the self-assembling material. For very high-resolution block copolymer systems, a ‘topcoat’ can be added during the process. This topcoat constrains the way the block copolymers self-assemble, forcing them into a regular, ordered structure perpendicular to the surface they are grown on. "Think of it like baking a cake," said Argonne nanoscientist Leonidas Ocola, a co-author of the study. "Without a mold for the cake, it can bake in a shape you don't want it to bake. Having the mold gives it that shape that you want. The mold creates boundary conditions needed to define the shape you want." "The topcoat and underlying lithographic pattern work together to guide the formation of the nanostructure and provide the morphology we want," he added. Although self-assembling materials in nanomanufacturing have been known for quite a while, using block copolymers with the topcoat creates patterns that can produce dense arrays of tiny wires. "A systems-level understanding of the template, topcoat and self-assembling block copolymer is the key to the whole process – you need to find a way to induce the block copolymer film to assembly into desired architectures for manufacturing, and be able to transfer the pattern of the block copolymer into the actual device materials, such as semiconducting silicon wires or conducting copper wires," explained Paul Nealey, professor in molecular engineering at the Institute for Molecular Engineering at the University of Chicago and another author of the study. Because the topcoat polymer layer does not need to be removed prior to the pattern transfer steps, and additional layers can be patterned on top of the topcoat, the system can be used to build up many kinds of complex patterns, as would be needed for the interconnections of a microchip. With the new method, "you wouldn't need to change all those machines," said co-author Karen Gleason, MIT associate provost and professor of chemical engineering. "And everything that's involved are well-known materials."